Better known amongst the kids as 3G, or the Gentle Giant Genie, TINY is the latest member to join the ranks of the TMP team. Having obtained a stellar track record for numerous best-selling magical inventions and products in the international magicians’ market, he represents a handful of elites in magical innovation and thinking emerging across the globe today. Immensely adored by children for his huge and cuddly teddy bear-like physique, TINY is the BIGGEST genie in town with a magic lamp chock full of whimsical adventures awaiting every kid who loves to dance and move! 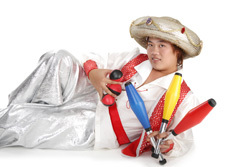 Specializing in creative fun movements choreographed into dazzling juggling acts, TINY brings with him a spellbinding show time to amaze both adults and children alike. Watch as he interacts and teaches his young audience to execute various cool moves. The children would soon discover their own natural flair for flamboyant and fun, yet challenging maneuvers! These have proven to be sessions the children remember for a long time to come! To sum it all up, it’s pure dancy, juggly, fun fun fun! TINY kicks off the show time with a skillful manipulation of juggling clubs and balls. With a little help from his Magic Lamp, TINY throws and catches these fre falling objects in a comedy fashion never quite seen before! A splash of colors and sounds, this is sure to get all children moving to the beat! The birthday child and other friends are invited up on stage for a little fun with spinning saucers. This has been named flying saucer for the comedic fact that the saucers are often sent whizzing off the air like an unidentified object in the clear summer night skies! Totally safe and loads of fun and laughter! TINY’s personal faourite piece of magic for the kids which he has been performing for more than 6 years. Funny, yet tricky, this offers the children an interactive experience with the performer as well as other children. The children will not believe their own eyes as they watch! Richie is a riotous goofball loved by kids and adults of all ages. A yakkety-yak who never ceases to talk, he will bombard each and every show with a cacophony of jokes and silly comments. Richie even sings a birthday song for the star of the day! © Copyright 2006, That Magical Party. All rights reserved.